HomeBlogWhat is Google Hotel Ads Commission Program (GHACP) and how does it work? The new cost-per-acquisition (CPA) programme by Google Hotel Ads (previously Google Hotel Finder) is now available to Mirai clients. This new system is called Google Hotel Ads Commission Program (hereinafter GHACP). CPA means cost per acquisition or, in other words and more commonly in hotel language, commission per booking. It’s a very different model to the regular metasearch engine one, which is CPC, also known as cost per click. With this CPA model, you come to an agreement with Google on the price to pay for a booking which is only paid if they get bookings. Yes. The bookings are made entirely on the hotel’s official website and the booking and the client are exclusive property of the hotel. The hotel will manage the charge directly as well as any other matter related to the booking. Nothing. Being a CPA model, you will just pay a commission to Google for confirmed bookings (cancellations and no-shows excluded) the following month after check-out. Since there is no initial investment, you eliminate the risk of high commissions paid out. Commissions vary between 10% and 15% on the net totals of the bookings, taxes and charges excluded. We recommend that you start with the lowest commission and optimise it in accordance with the efficiency of your campaigns. How does Google know when a booking comes from GHACP? It’s similar to the Adwords attribution system which you already know about. By clicking on a link of your hotel that belongs to GHACP, Google leaves a cookie in the user’s browser. If this user carries out a booking while the cookie is still active, the conversion code installed in the Mirai engine is executed and the booking is “assigned” to GHACP. How long does the GHACP cookie last for? The cookie has a duration between 1 and 30 days. This period is called “conversion window”. At Mirai, we start operating with a conversion window of 1 day and we optimise its duration with the development of the campaigns. What happens with booking cancellations, modifications and no-shows? Cancellations and no-shows: if the user cancels on the website, Mirai will report it to Google directly and no commission will be charged. If it’s cancelled through other channels or it was a no-show, you must indicate it in the monthly booking review. Mirai will report it to Google and no commission will be charged. Booking modifications: in the monthly review, if you note a booking modification, Mirai will report it to Google and you will be charged the commission of the modified value. Remember that you have 10 days to review your bookings. After this period of time, Google will charge the commissions that correspond to your non-cancelled bookings. Will I see the GHACP bookings in Google Analytics? Yes, you can see the bookings indicated with the source “hotelfinder”, medium “CPA”. Also, Google can also charge another booking that you see from another source medium in Analytics if it previously had a GHACP click within the conversion window. How will my hotel be seen on Google? How does Google calculate the position or ranking of the adverts? In the same way as if you were bidding on CPC, Google converts the CPA percentage in an equivalent CPC bid and it continues having your account’s competitive price and level of quality. The more commission you pay, the better position you will have in this system. This entire process is completely transparent for the user and for you. Can I bid for CPC and CPA at the same time? No. A hotel can be in one system or the other but never in both at the same time. As matter of principle there is no set time for each, so each hotel can change from one system to the other as they see fit. I’m already investing in Google Hotel Ads by CPC. Should I change to CPA? If your paid-out commission in Google Hotel Ads CPC in the past has been above 15%, you should transfer to CPA. If it’s below 15%, you should remain with your CPC campaigns. Who handles all of this, Mirai or the hotel? Mirai. If you want to take part, inform your account manager at Mirai and we will take care of all the necessary actions. Will Google charge commissions directly to me? No. The invoicing of this system is centralised through Google partners such as Mirai. Google will send us a detailed breakdown of your confirmed bookings from the previous months, we will revise them (with your review of them, of course) and then pay them with a single invoice to Google. Afterwards, Mirai will re-invoice the corresponding amounts to our clients, like with the CPC system of Google Hotel Ads. Is this the Book on Google system which I have heard about? No. GHACP is not Book on Google. GHACP is a commission system but the booking is always made on the hotel website and the client always belongs to the hotel. It is not booked on Google pages. We have written a series of posts about Book on Google. You can start in the first one What is Book on Google and how the client sees it. What should I do if I want to connect to GHACP? If you are a Mirai client, all you need to do is notify your account manager. If you’re not a client, you will need to search for an authorised Google Hotel Ads partner. At Mirai, we encourage you to try it for a period of time. If you don’t participate with your direct sales, Google will show the prices of your OTAs and the client will book through one of them instead of on your website. Contact your account manager for any further questions. 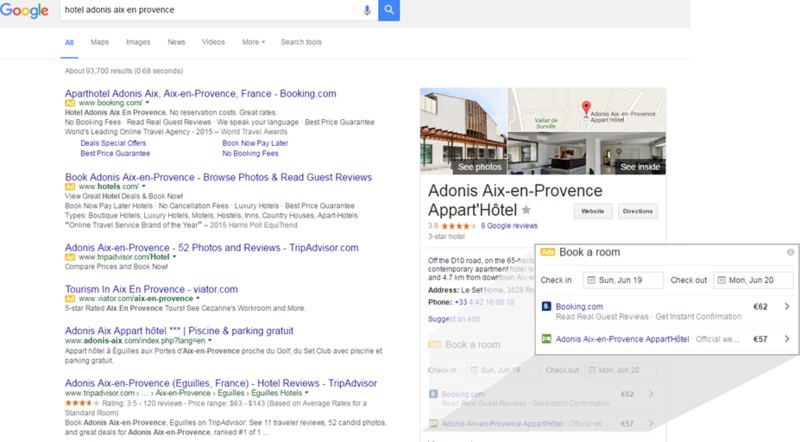 As a hotelier, what your Google Hotel Ads strategy should be? We wrote a specific post about it. You can find it here. I want to connect with google booking hotels but i have no idea for registration and how is it money pay to me without any account details.